Former Vice President Joe Biden allegedly had forehead-to-forehead conversations with women who weren’t his wife. 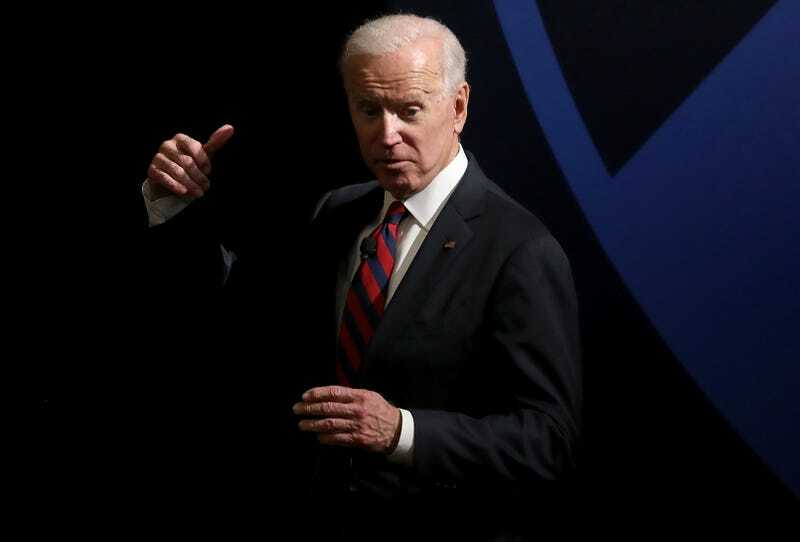 According to three women who spoke with The Washington Post, Biden reportedly made them uncomfortable during brief meetings with the potential frontrunner for the Democratic nomination, should Biden ever officially declare. The women, Vail Kohnert-Yount, Sofie Karasek and Ally Coll, recounted times in which Biden touched them; two of the women claimed that Biden came forehead to forehead with them in an article published late Wednesday, just shortly after Biden released a two-minute video to pledge to be more mindful of women’s personal space. Kohnert-Yount told the newspaper that in 2013 while working as an intern in the White House, Biden introduced himself to her and shook her hand. Kohnert-Yount added that she didn’t believe that the incident was sexual harassment or assault. Karasek told the Post that she met Biden during the Oscars where she appeared with a group of 51 sexual assault survivors and Lady Gaga in 2016. After telling Biden about a friend who’d committed suicide, she claims that Biden took her hands and put his forehead against hers. Karasek told the Post that while she appreciated Biden’s support, she wasn’t cool with Biden’s forehead being all up in her personal space, and by personal space, I mean being directly against her forehead. The total number of women claiming that Biden does not know when to break the huddle has grown to seven. Caitlyn Caruso, D. J. Hill, former Nevada state lawmaker Lucy Flores and Amy Lappos, a former congressional aide to Rep. Jim Himes (D-Conn.), have all come forward publicly with allegations in recent days, The Hill reports. I don’t know a time when women wanted nonconsensual forehead-to-forehead touching or for men to invade their personal space, but noting that “social norms have changed” feels like a “Make America Great Again” statement from Biden, where it sounded good but he might want to rethink this. In fact, he might want to rethink all of it, including running for president.